Location: Del Mar Avenue and Virginia Vista Court, Bixby Knolls neighborhood of Long Beach. From the 405 Freeway, take the Long Beach Blvd. exit and head north for 0.2 miles. Turn left on 36th St., go 0.3 miles and bear right on Country Club. Go 0.3 miles and turn left on Los Cerritos Park Place. Follow it past the side of the park to a T-junction and turn right on Del Mar. The entrance (unmarked, just a gap in the fence) to the wetlands will be on the left in half a mile, just before Virginia Vista (a private road). Park on the street for free, keeping in mind posted restrictions about time and days. 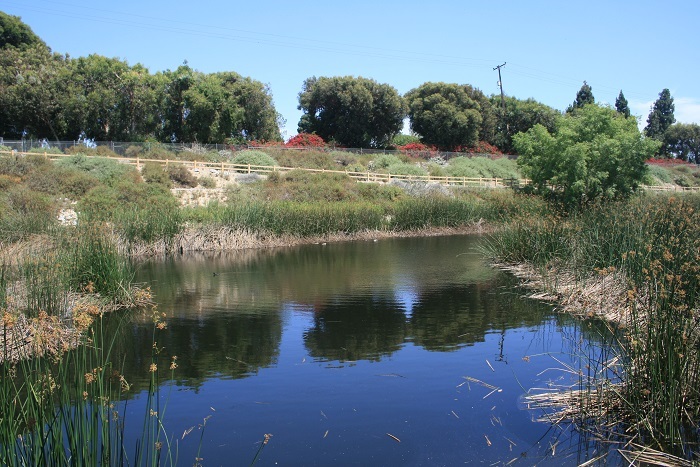 Most hikers probably won’t drive too far to visit the Dominguez Gap Wetlands, but for residents of Long Beach – the Bixby Knolls area in particular – this pleasant little pocket of open space is an enjoyable place to explore. 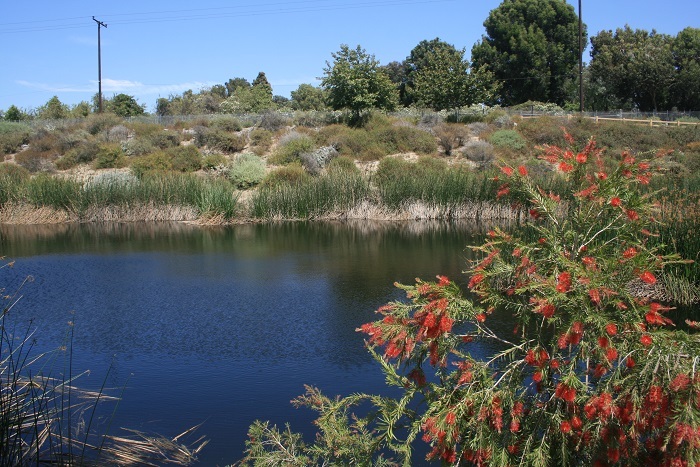 The park occupies a thin corridor between the 710 Freeway and the Virginia Country Club. In addition to the attractive pools of water, this spot is a good one for birdwatching. Ducks, blackbirds, hawks and cormorants are among the fowl that might be seen here. 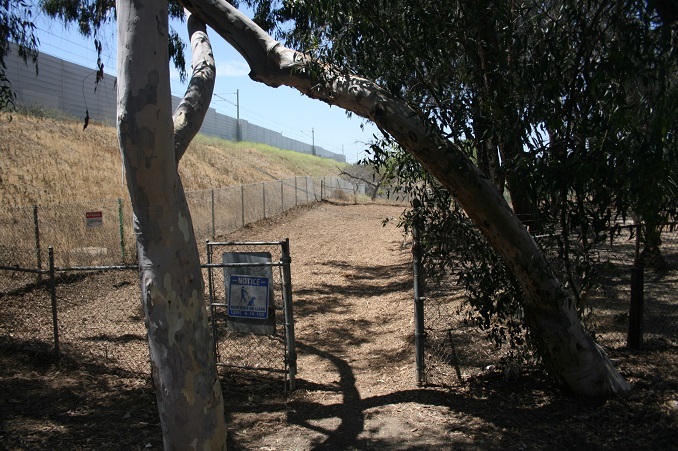 From Del Mar Avenue, enter the park through a gap in the chain linked fence. Follow a wide walkway a short distance to the beginning of the loop. 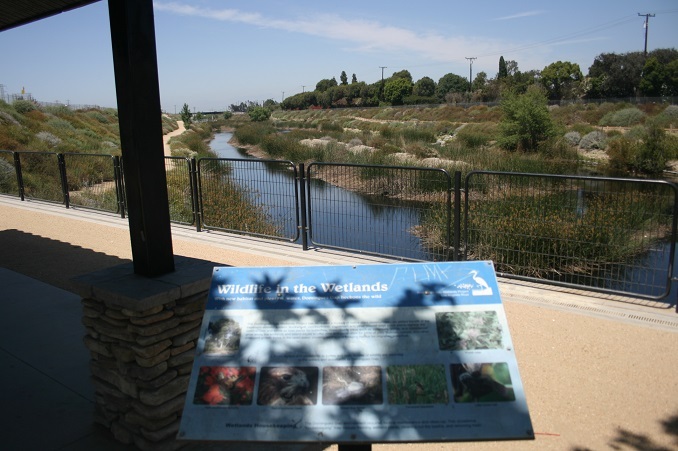 There are a few benches beneath a shade structure and interpretive plaques describing the restoration process of the wetlands. The loop can be hiked in either direction. To go clockwise, look for a dirt walkway descending slightly (as opposed to the spur leading to the paved bike trail). The opposite end of the loop branches off on the right in a similar manner; use this if you would prefer to hike counter-clockwise. 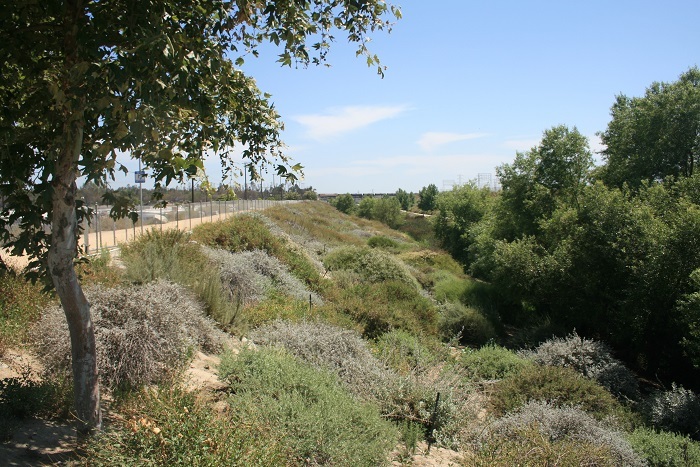 The trail borders the wetlands, briefly sharing a portion of the bike path, crossing under a railroad bridge before finally reaching a turnaround point at Del Amo Blvd (about 1.2 miles from the starting point). 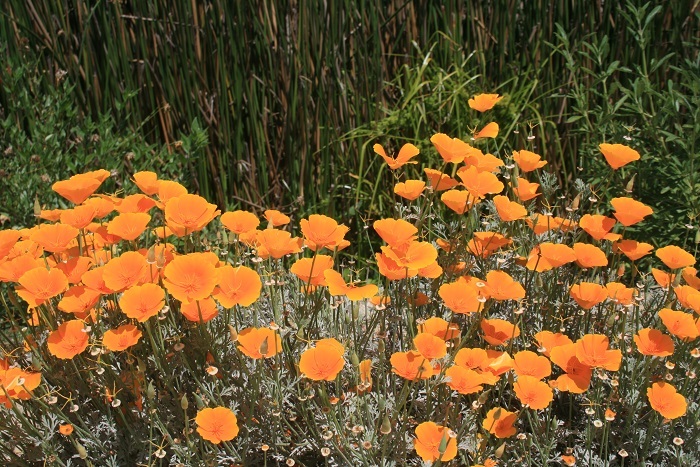 Along the way keep an eye out for plant life including California Golden Poppies and Indian Paintbrush as well as the diverse array of birds (possibly rabbits too). Once you reach Del Amo, turn around and follow the opposite side of the loop back to Del Mar Avenue. Thanks for the info but I want to make a correction for the entrance way. The entrance way start from Del Amo where there is free parking and playground. You start from there and come back following the sign and track. My group followed the direction from the website and we realized it is incorrect. We hiked backward and inconvenient to find parking on the street because it is a private area. Not only that, we started off on a soft road and we didn’t know that the soft road is for horses lol. So for those of you who want to go there, the correct entrance way is from Del Amo. Overall, we had fun and will go again entering from Del Amo. Just watch out for coyote. Hi Sala, thank you for the update and I apologize for any inconvenience. It has been a while since the original post was written and accessibility to hikes often changes, so I will update this post as soon as I get a chance to revisit Dominguez Gap.